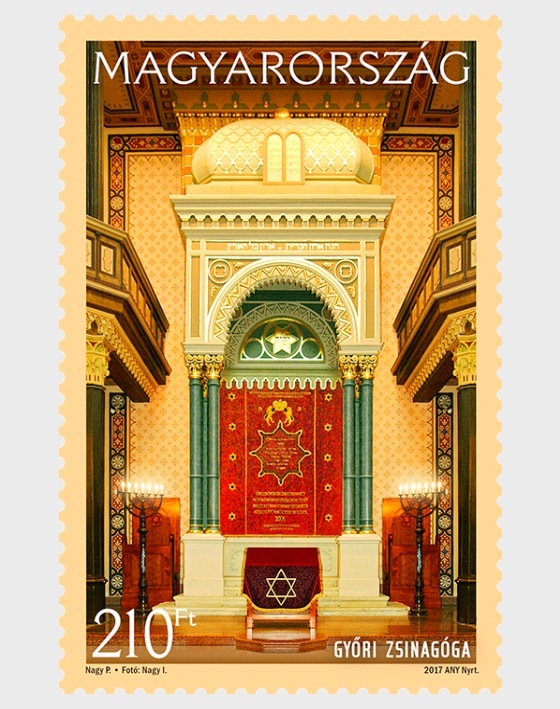 Magyar Posta continues its series of stamps presenting the synagogues of Hungary in 2017. The set of two stamps shows the altar and details of the interior of the synagogues in Győr and Pécs, while typical ornamental features appear on the first day cover. The special set of two stamps was designed by the graphic artist Péter Nagy and produced by the printing company ANY Security Printing Company. The new issue will go on sale at first day post offices and Filaposta in Hungary from 5 September 2017, but may also be ordered from Magyar Posta’s online store. Győr synagogue ● The building complex comprising a school and a house of prayer was designed by Károly Benkó. The school opened in 1869 and the synagogue was first used for worship in 1870. The building is one of the very first examples and a fundamental work of the neolog movement. The temple built in the spirit of late historicism and the Secession for a long time served as a model for the construction of synagogues in other towns and deservedly became the archetype of large capacity synagogues in an urban environment. The Torah ark with blue columns and an elongated dome is situated on the eastern side of the interior. The section where women pray is on seven sides of the octagonal space on two floors. The internal decoration of the synagogue is typified by historicising patterns fashionable at the time of its construction. However, the structure of the building follows the modern iron-based method of the second half of the 19th century. In 1927 a so-called winter temple was added to the building, which has stood empty in part since 1960. The school wing housed the Academy of Music, and the house of prayer continues to function there. The synagogue was acquired by the state in 1968 and by the municipality in 1993. Later, it underwent full renovation, which was completed in 2006. Pécs synagogue ● Of the surviving, operating synagogues in the provinces of Hungary, the one in Pécs is among the most beautiful. It was consecrated in 1869. Transdanubia's largest synagogue was built in the Romantic style based on the designs of the most outstanding architect of the period, Frigyes Feszl, as well as those of Károly Gerster and Lipót Kauser. Later it was expanded in 1905. The most prominent feature of the facade is the ornamented clock in the semicircular tympanum, and the large decorative windows and the small onion-shaped domes on the corners of the synagogue define the building's character. The rich ornamentation of the space for worship, which is dominated by blue, brown and red colours, is derived from the same source, thus having a single effect. Seating for men is in wooden pews, while women are accommodated in galleries with carved wooden balustrades on two floors supported by thin columns on each side. The interior space of the synagogue divided in three retains its original form and endeavours were made to ensure the preservation of such historic values during renovation works. The synagogue also houses an organ, which is a monument of industrial history, as it was the first organ of the Pécs Angster Organ Manufactory that used to enjoy high repute.